Iraq's oil reserves are the second largest in the world. But new investments and deployment of modern technology are necessary to help the country reach its potential. Water conflicts in the Middle East threaten to further endanger Iraq's water resources, which suffered from the past regimes policies and technology challenges. Geoscientists are pitching in to help restore Iraq's historic marshland area, now dramatically reduced because of water management practices in the region. Geotimes continues to cover geological issues in Iraq. Read our past coverage here. Reconstructing Afghanistan: Nation Building or Nation Failure? As the Coalition forces begin reconstructing Iraq, Afghanistan continues to undergo its own rebuilding process. Whether the country continues to fail or rises to succeed may depend on U.S. efforts to help develop Afghanistans vast natural resources. 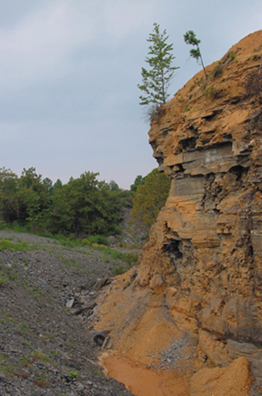 The American Geological Institute (AGI) and the AGI Foundation launch the William L. Fisher Congressional Geoscience Fellowship endowment. A student shares his experiences at the Webb Schools, which holds the only large paleontology museum in the world located on a high school campus. Advanced seismic networks and new earthquake simulation tools are taking seismologists closer than ever to meeting the goal of quake early warning. Take a whirlwind tour through London's streets and phone lines in pursuit of William Smith's famous 1815 geologic map of Britain. Ma'dan, or Marsh Arabs, fish in the Qurnah marsh in southern Iraq on May 16, 2003. Such subsistence living provides a majority of food sources for the region. 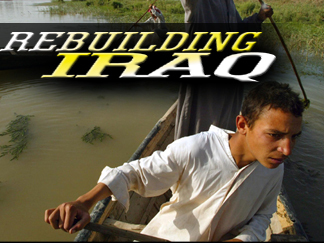 Decades of damming and canal building under Saddam Hussein's regime and in other parts of the Middle East have diminished the Iraqi marshlands to 7 percent their original size. Read related stories on water resources and plans for restoring the marshlands. Photo from AP/Wide World Photos.